BBC NEWS | Programmes | Breakfast with Frost | Sir David interviewed Mordecai Vanunu, Nuclear Whistleblower. 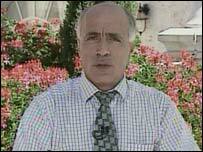 Sir David interviewed Mordecai Vanunu, Nuclear Whistleblower. Please note "BBC Breakfast with Frost" must be credited if any part of this transcript is used. DAVID FROST: This is the stuff of spy novels: a beautiful agent, a dramatic kidnapping and state secrets - the story of Mordechai Vanunu grabbed international attention when he became the first person to blow the whistle on Israel's nuclear programme 18 years ago. He paid a high price for what he described as his act of conscience and this is how his trial made news with Moira Stewart in March 1988. DAVID FROST: Mordechai Vanunu was released from jail in April of this year but has been refused permission to leave Israel and has had many restrictions imposed on him, including a ban on contact with foreigners either by phone or in person. In defiance of this ban, he joins us now from Jerusalem for his first television interview since being released. Mr Vanunu, thank you for joining us. Good morning. MORDECHAI VANUNU: Good morning London. I am very glad to talk to you and to be part in talking to the British from her. DAVID FROST: Well we're delighted to be talking. Tell me, the story we all heard about how the Israelis managed to get you back, kidnap you, abduct you from London to Rome and then on, is that - tell us in your own words what happened. MORDECHAI VANUNU: About the kidnapping? The kidnapping started from London in September 30th 1986 I decided to leave London because The Sunday Times delayed the publication of my article and I travelled from London to Rome with an American woman, her name is Cindy, and we arrived to Rome. And from Rome we drove to her home by Italian driver and immediately when I arrived at the house, I was attacked by two men and one woman. One woman drugged me, the two men were an Israel man and a Frenchman. After half hour or such time we drove, they drove me by car back to the beach and from the beach to a small boat, yacht, and there I was chained and going back to Israel seven days. In the boat I asked them who are you in the boat and the men there told we are here British, French and Israel people - which means behind this kidnapping were British, France and Israel spy. In my view these three states also were the states behind the nuclear proliferation during the Cold War in many states and they were endangered by my revelations and they tried to stop me and silence me and sent me back to Israel by this kidnapping from Rome that ended in Israel with 18 years in prison. But now I am free, I am talking and I hope the world will be much more interesting and involved in this not proliferation weapons of mass destruction to any state, including Israel. DAVID FROST: And in terms of this situation, that was why, was it, that you came to London to give the secrets of the Dimona plant, atomic plant, in The Sunday Times - it was because of your belief in non-proliferation, yes, was it? MORDECHAI VANUNU: Yes because I decided that the world should know what this small state, with five million Israeli people, doing in secret and what this small state can do every small state in all the world can do. It is much more important that these small states, five million people, have produced so much stockpile of nuclear weapons, about 200 atomic bombs, with the new more powerful atomic bomb, the hydrogen bomb and the neutron bomb. And that was no any real justification for Israel, that all the world knew about Israel atomic bomb but no one realised the powerful and the many weapons they produced, and much more the hydrogen bomb that have no justification in these Middle East very small states, and around Israel you cannot use no hydrogen bomb, no atomic bomb. And that's what I came to inform the world and to try to stop this nuclear proliferation and also my hope was by revealing Israel's nuclear secret will bring new step towards real peace in the Middle East and the abolition of nuclear weapons in all the Middle East. DAVID FROST: And tell me something, you did this as an act of conscience but lots of people in Israel, the majority of people in Israel probably, still regard you as a traitor. Can you understand that? MORDECHAI VANUNU: Of course I understand their minds but the Israel people was exposed only to the Israel media, the Israel media brainwash, the Israel media bias against me. Not they, they were not open to see all the story and all the danger of nuclear weapons in secret in such small state, Israel. And also that these people was not exposed to the idea that these Israel people were sending a lot of propaganda, what they call holocaust industry, to know and to understand that nuclear weapons are the real holocaust and the Jewish people have no right and no justification to use the atomic bomb. And the Israeli people was exposed only to the Israel media and for that reason they are following Israel propaganda that I am a traitor but the real traitors are the government of Israel who wouldn't let them know the truth about the atomic bomb in Israel. DAVID FROST: And what, and what do you want to happen now? I read that you are planning to get married, do you also want to leave Israel as soon as you can? MORDECHAI VANUNU: Yes, absolutely, I want to feel free, I am not free here, I was released from prison but I an under restriction and under threat and danger by the Israel people who don't like what did and also don't like my Christianity. This is another traitor for them, my Christianity. So the only way to freedom, to enjoy freedom and start my new life as a free human being will be when I can leave Israel and live my life abroad in United States or in Europe or in London, and that's what I'm waiting that the Israel government will say it's enough, 18 years in prison, and I should go and start my new life. DAVID FROST: Start your new life. Do you feel the best years of your life were taken from you? MORDECHAI VANUNU: Absolutely my best year, from the age of 32 to 50 was the best year that every human being has, it is his best time of life. But I survived this very cruel, barbaric treatment in isolation in Israel and now I hope I can live, on the age of 50, I can start a new life and enjoy life and can have my family and my freedom and contribute also for peace and for the abolition of nuclear weapons - not only in Israel but also in all the world, including England, France and everywhere. DAVID FROST: Mr Vanunu, thank you very much indeed for joining us. We really appreciate it. MORDECHAI VANUNU: I am very glad to talk to you and I hope next time we can meet in London - you today made history by this live interview to London and next time I hope the situation will be much better and I can talk in your studio and many other places around the world. Thank you very much. Because of the possibility of mis-hearing and the difficulty, in some cases, of identifying individual speakers, the BBC cannot vouch for its accuracy.